After the drama of the previous evening when we struggled to find each other, the morning of Day 2 was sublime. 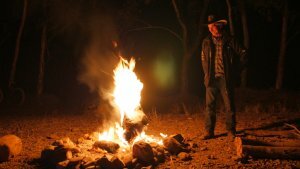 There was a chill in the air as the sun rose over the white gums and sandy river bed; the campfire still smouldering from the evening. It was 9.20am before I set off, able to follow the vehicle tracks made by Bob the previous evening. Bob and Brian caught me at 15 Mile Camp after about an hour and we made our way down the river – with the vehicle going ahead and waiting for me about every 5km. There was a brisk head wind which added extra resistance; I am constantly working to stay upright, whether on sand or loose stones. Following in fresh vehicle tracks in sand is generally much harder than cycling on virgin sand because the wheels disturb sand that has settled by the elements. Following Bob’s tracks over the loose stones tends to help because the 4 tonne vehicle compacts the bed of stones somewhat. All along the river were animal tracks. The hoofed animals make a real mess of ‘my’ surface and really made it much rougher. 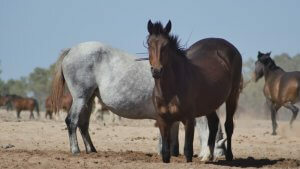 We saw a few cattle, a couple of donkeys and, nearer to Hermannsburg/Ntaria a lot of brumbies. In Ntaria we tried to look up an Arrernte Elder whom Amelia Turner in Alice Springs had recommended, but he was not well and in Alice Springs hospital. We were wanting to meet some local people to get more of a feel for what the river means to them, but didn’t get anywhere. We eventually set off toward Palm Valley at 4pm, pushing along the river bed as before. After 8km our route joined with the main 4WD track to Palm Valley, which is on the Palm Creek, a tributary of the Finke. We made a diversion to the camp ground, about 12 km on the good track and made it there as the sun set turning the rugged gorges and hills a fiery red. 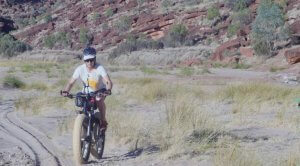 The word has been getting around that I am cycling the length of the Finke and when travellers at the campground see my bike, they tend to be blown away. There are all sorts of questions, but universally people seem to be incredibly interested. 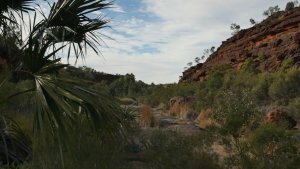 We drove the 4km to Palm Valley over an incredibly rough, rocky track and were in awe of the location; red cabbage palms (that probably got there transported by birds or people and not, as I once learned, a relic of prehistoric times), cycads and ghost gums against the red cliffs. We returned to where I stopped cycling yesterday and I set off at 11am, firstly along the same 4WD track which wound it’s way back and forth over the river, before turning off after 8km to follow some wheel tracks towards Finke Gorge. It was utterly spectacular. The next 20km following the river bed – sand, loose stones, sometimes over grass, and through the bush – was incredibly rough going but it was one of the days where I just wanted to video the whole experience to keep it forever. There was no evidence of hoofed animals here and I was often cycling over the fine, soft sand with incredibly rugged, red-rust coloured cliffs that have been there for at least a hundred million years. The place feels timeless too. It is easy to see why it is so important for the local Western Arrernte people. It is believed that this the part of the river is some of the oldest because it meanders through the ancient mountains and rivers don’t meander through ranges, normally the water runs off – therefore it is thought that this part of the river was there before the mountains were formed. The ranges were once bigger than the Himalayas and have eroded over time. I had been worried that the support vehicle couldn’t get through this section as no tracks were visible on our various maps, but Bob is such a skilled driver, often making his own track and using intuition to make the right choices when following old tyre tracks. While Bob and Brian were waiting for me at Palm Glen Valley (there were a few cabbage palms here too), Bob spotted a cave high in the cliff face and the two climbed and scrambled up the scree for a bird’s eye view of the valley. Brian had a great day with his drone, capturing incredible scenery from high above the valley. Towards the end though, he crashed it into a tree and he and Bob between them managed to fix it with fencing wire and a small stick on mulga wood! It works fine now and Brian was able to capture the late afternoon light at Boggy Hole. Today I covered 40km (starting at 11am), and although my body and the bike are taking a beating, I feel I am starting to feel stronger. The experience is well worth the effort so far!